One of my all time favorite ’40 Ford coupes happens to be the very first car ever registered for the “Street Rod Nationals”, owned by Gene Sonnen, from Minneapolis. 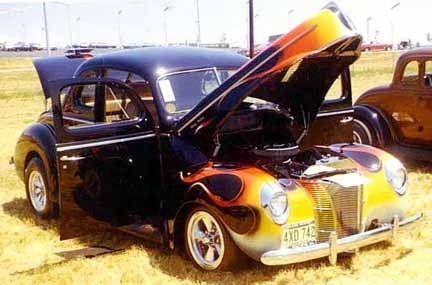 Gene’s ’40 sat good, had cool flames and lots of cool pinstriping, as well as a set of 5 spoke mags (dunno what brand). 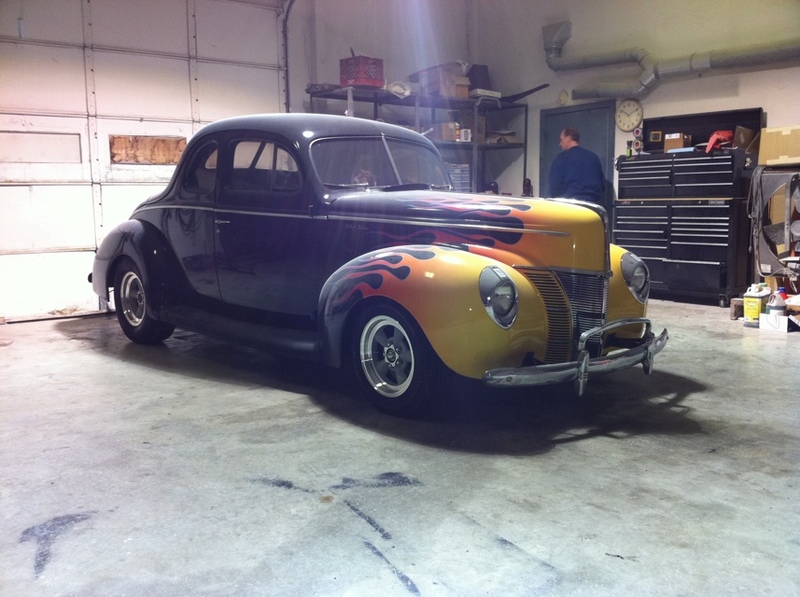 Since that time, I knew that some day, my ’40 coupe would have flames and a set of American Torq Thrusts! I had resisted the temptation to buy the Americans, and since 1995, when I got the ’40 on the street, I have been running a mixture of Dodge van wheels in the back (15×7), and Dodge Scamp wheels in the front (14×4.5). They are rattle canned red, and for a while ran spun aluminum Moon discs, and for the last several years, baby moons and ribbed ’40 trim rings. About 2 months ago, I finally broke down and bought a set of Americans, new tires, etc, and was excited to put them on the ’40. Only problem is that the new rear tires, even though they were the same size as the old ones (on paper), the physical tire size was fatter, and rubbed on my fenders. I hunted high and low, and found a narrower 8″ Ford rear end (thanks Dave Johnson! ), that would allow for about 3/4″ between the fender opening and the tire. I had planned on swapping all of my brake hardware from the old 8″ to the new one, until I realized the brake drums wouldn’t work with the newly acquired rear end’s axles. After spending a small fortune at O’Reilly Automotive, I was able to get all the parts, and finally, Doug and I got the chance to swap out the rear end today. Started the project about 3pm this afternoon and bled the brakes and mounted the Americans around 10pm. (Took a run to O’Reilly’s to get some new wheel cylinders and a stop at Subway in Ozark in the process). Good news is that the ’40 now has it’s Americans, the rear end has totally new brakes, and I can’t wait to run back down to Doug’s shop to pick it up. I miss it!